This is the Cherished Teddies 2006 Charter Symbol of Membearship figurine. 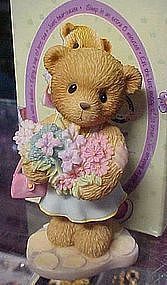 It depicts a bear with an armful of flowers and a pink handbag. Robyn comes in her original box, packaging, and papers.